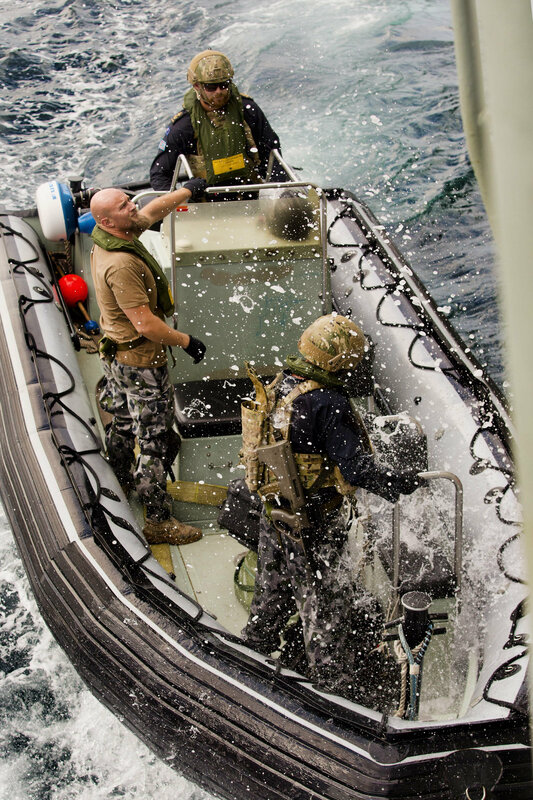 Special Agent Patrick Price brought a special brand of law enforcement to Her Majesty’s Australian Ship (HMAS) Melbourne while on patrol in the Arabian Sea. Special Agent Patrick Price (left) of the United States Naval Criminal Investigative Service (NCIS) prepares to board a fishing dhow suspected of illegal drug smuggling in the Arabian Sea. Special Agent Price, of the United States Naval Criminal Investigative Service (NCIS), works for the Middle East Field Office Transnational Crimes Unit (TCU) based in Bahrain and was assigned to Combined Task Force 150 (CTF 150). CTF 150 is the multi-national counter- terrorism Task Force, whose mission includes the interception of drug smuggling operations, which helps fund terrorist activities. NCIS TCU Special Agents deploy aboard coalition warships assigned to CTF 150 and provide law enforcement expertise during maritime security operations in the Arabian Sea and Indian Ocean. 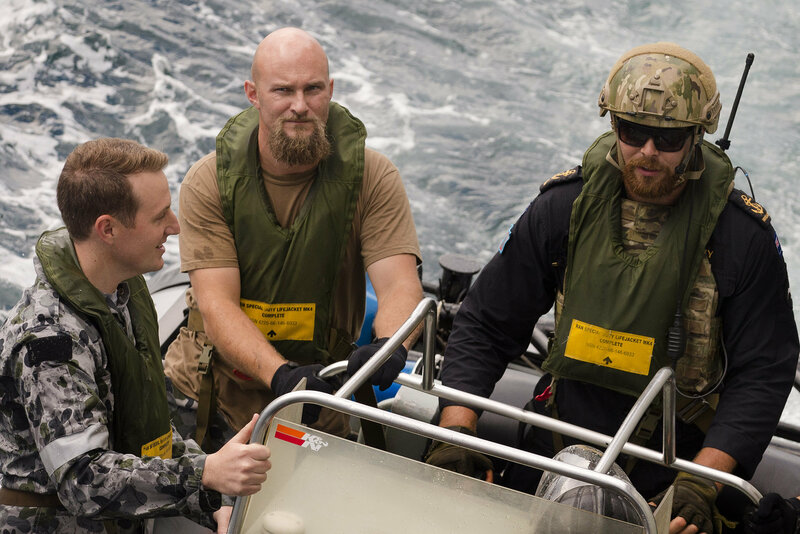 Since 2013, the TCU has deployed agents on 15 separate missions aboard warships from the United States, France, New Zealand, Australia, Canada and the United Kingdom. He was attached to HMAS Melbourne, which is patrolling the Middle East Region during the warship’s second patrol of 2015. Special Agent Price said that the TCU’s mission was twofold. “First, we support US and coalition forces in interdiction operations in the region,” he said. Special Agent Price’s primary responsibility was to act as a law enforcement advisor to HMAS Melbourne’s Commanding Officer. He also provided search techniques advice and support to boarding parties working on vessels suspected of narcotics smuggling. “If something is found, such as heroin or other narcotics, we try to gain some intelligence such as where the drugs came from and where they were going,” Special Agent Price said. (L-R) Royal Australian Navy Lieutenant Liam Catterson, Boarding Party Officer, Special Agent Patrick Price of the United States Naval Criminal Investigative Service (NCIS) and Royal New Zealand Navy sailor Leading Seaman Combat Specialist Jack Walters prepare to board a fishing dhow suspected of illegal drug smuggling in the Arabian Sea. Special Agent Price said he loves working on foreign warships, with Australian ships being his personal favourite. HMAS Melbourne is patrolling the Middle East Region as part of Australia’s contribution to the Combined Maritime Forces (CMF), which oversees the work of CTF150.